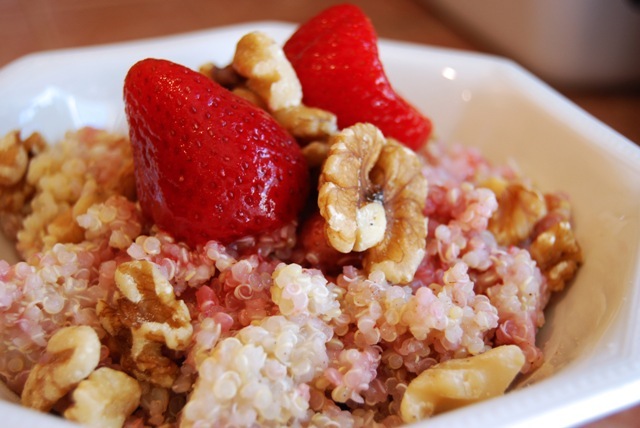 Here is a nutrient packed energy breakfast that the whole family will enjoy! Rinse quinoa & transfer to saucepan. Stir in water, maple syrup & cinnamon. Bring to boil. Reduce heat, simmer for 12 minutes or until water is absorbed. Add strawberries & walnuts. Serve with almond milk. « Do Vegan Parents Raise More “Ethically Aware” Children? If the oatmeal wasn’t already cooking, I’d stop everything and make this! Tomorrow. Tomorrow…. Mmmm that looks really yummy. This is REALLY good.. and a very satisfying. Next time I’ll put in less syrup as I thought it was a little too sweet, but this (and variations of it) are a new staple. Thanks for sharing! I am so trying this for breakfast – maybe not with strawberries though hummm raspberries maybe!